One of the sessions I presented at DNNCon Palm Beach 2014 was greatly inspired by all of you. 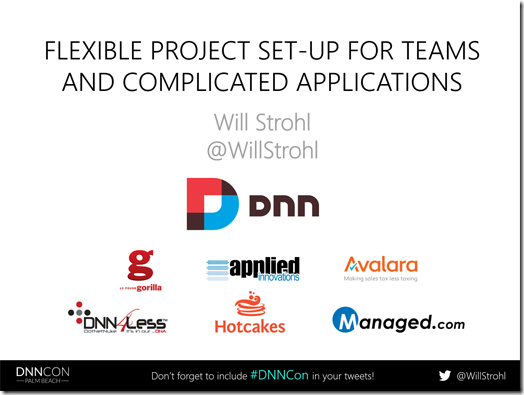 During my years consulting and then into my time training large companies at DNN Corp, I kept getting a common question, “how do I do this with large/enterprise teams?” It’s way too easy to try and walk them through doing all of the hard work of trying work around the single-developer project architecture that you’re used to seeing in videos and wiki articles – but that’s not the answer they’re looking for. If you have a complicated project and/or a team of 2 or more people working on code that’s all supposed to work together, there has to be a far simpler solution – and there is! When you’re working with teams and/or have a requirement for a more flexible project set-up, you’re in luck. DNN has had the tools that you need included with its source for quite some time. With a bit of creativity, you too can put all of your projects into a single solution and never even think of checking in your website. Oh yeah, we know you’ve done it. No need for that mess anymore. If you attended my training session the Friday before DNNCon, then you were lucky enough to build this together with me, hands-on! The slide deck from my presentation is below. A download link to an empty solution and a PDF version of the slide deck follow. A huge thanks goes out to Joe Brinkman. Without his help, I wouldn’t have figured this all out on my own. This blog is cross-posted from my personal blog site.